A couple days before the race I had the opportunity to spend some time at Clif bar HQ for their media summit. Ian Sharman, Linsey Corbin, and I spent Thursday doing some fun interviews and discussed our race day gear and quirks with the media. It was a lot of fun! One of the highlights was interviewing with Mitzi Dulan, one of the most well-know registered dietitians in the country! I drove up to Healdsburg Thursday night after playing at Clif bar so I could have at least a day to relax. I've been traveling a lot in the last month, so a day to relax and recover was exactly what I needed. And what better place to do than in wine country! The day before the race I parked myself at a coffee shop to get some work done. Turns out a few other familiar faces had the same idea :) I was a great way to relax AND be social. Later that night I was trying to get both myself and my gear ready and I realized I was a little fuzzy on the details. "How many gels do I need? Should I have a drop bag? Oh yeah....I should get some coffee ready for the morning." Needless to say I was a little scattered. I made a rookie mistake that night as I ate brown rice and Indian curry with some kale. Kale? Really? You ate kale and Indian food the night before a 50 miler? Ooops. Yep, I had some stomach issues in the first half of the race. Next time I'm eating white rice and salmon! Race morning I woke up to some drizzly, foggy weather. Not a problem for me. I don't like to be cold, but I love crappy conditions. I planned to arrive at the course by 6:10 for a 6:30 start. For some reason (I did this last time too) I arrived just minutes before the start. I grabbed my number and pinned it on just in time to hear "Two minutes until the start" I ran back to my car to get my pack and jogged to the start line with less than a minute to spare. Guess I wasn't going to have a drop bag :) I actually didn't mind cutting it close. Less time to sit around and get nervous. 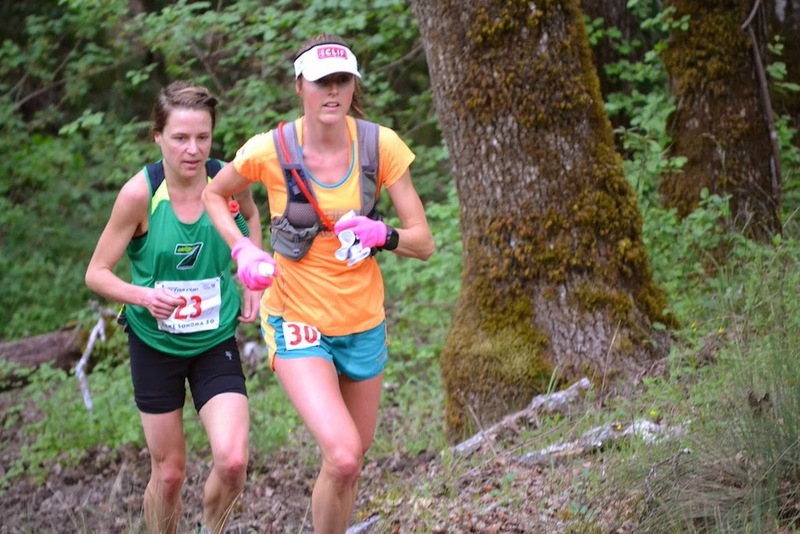 Once the race started I quickly found Emily Harrison and Jodee Adams-Moore. We chit chatted a little for the first couple hours. It was nice to have some company! We took turns leading but were never more than a few seconds apart. 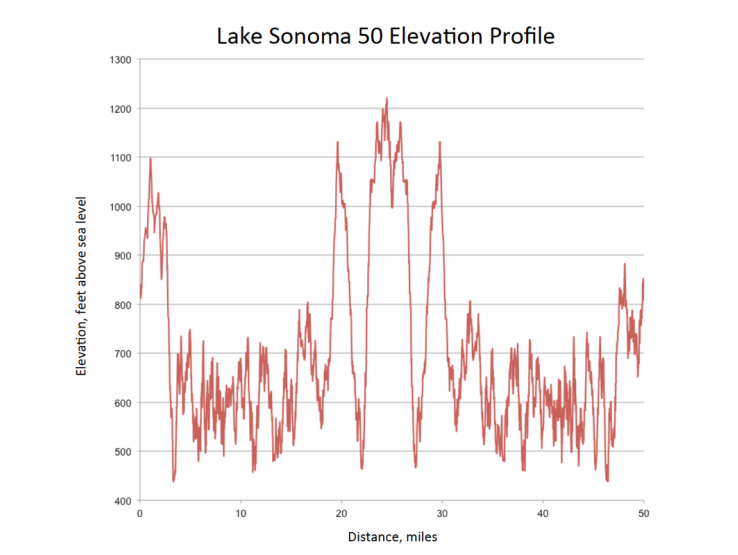 The first 11 miles of Lake Sonoma consists of rollers, with a net downhill. It's so easy to run too fast- I made that mistake last time. My goal during the first part of the race was to relax and be patient. I think I accomplished my goal because I felt great (besides the stomach issues) and was smiling quite a bit. Somewhere around mile 15 or 16, I had to stop yet again and Emily got away. And I never saw her again. The gap between us stayed pretty consistent, but I was never able to chip away at it. My favorite part of the course is the long grinder hills (3 of them) near the half-way point of the race. I struggled a bit with the short rollers, because I couldn't get into a groove. The long hills were great though! I surprised myself by running the whole time. 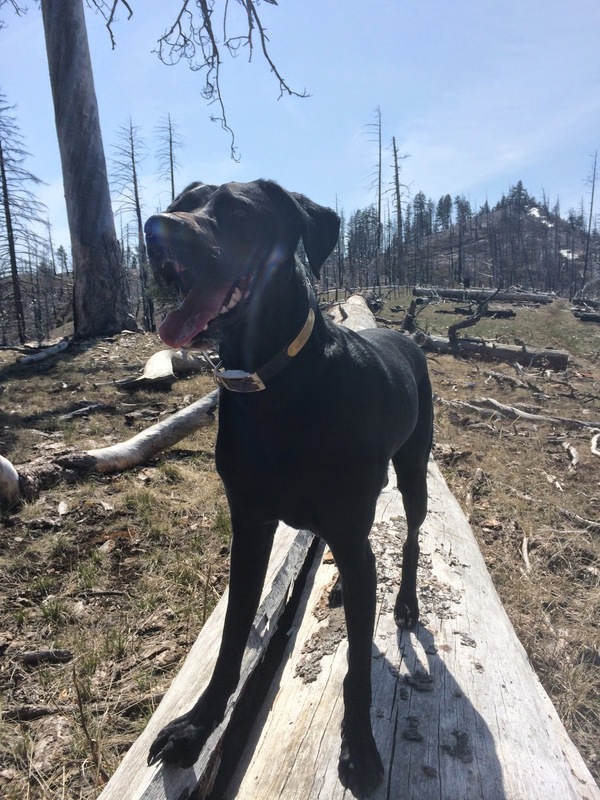 I usually like to hike, but the running was feeling good, so I went with it. After leaving the halfway point, I realized that I was pretty much running alone. Which I was ok with. I was just in my own little world, enjoying the day. I felt great from mile 25-40, which is not normal for me. This is usually where I have a little rough patch or low energy section of a 50 miler. Not today though! I was really on top of my nutrition (every 15 minutes!) and my energy levels were great. Woohoo! I was actually having a lot of fun. The last mile is always hard. It's uphill and there are a few little rocky patches. I made it 49.5 miles without falling, and then in the last half mile, just before you cross the road to the finish, I took a digger. Figures. I tend to fall when I get tired because I don't pick up my feet enough! Ha. I was still in a good mood though, so I laughed out loud at myself. Crossing the finish line is always such a great feeling. I finished in 7:33, which was under the previous course record. Success! Emily set new a new blazing CR of 7:26. Wow! Good day for 2nd place finishes for TNF athletes! Easter weekend Zach and I have a tradition of doing some crazy adventure and making cioppino for dinner. And this year was no exception. Well, this adventure was a little tame for us, but to my credit I was still recovering! Next up: lots of travel and running. I'm looking forward to it! Hi Stephanie! I love your blog - I'm pretty new to trail running but I've set my sights on an ultra (eventually!) and I have enjoyed reading about all the different amazing courses and races out there. Very inspiring! 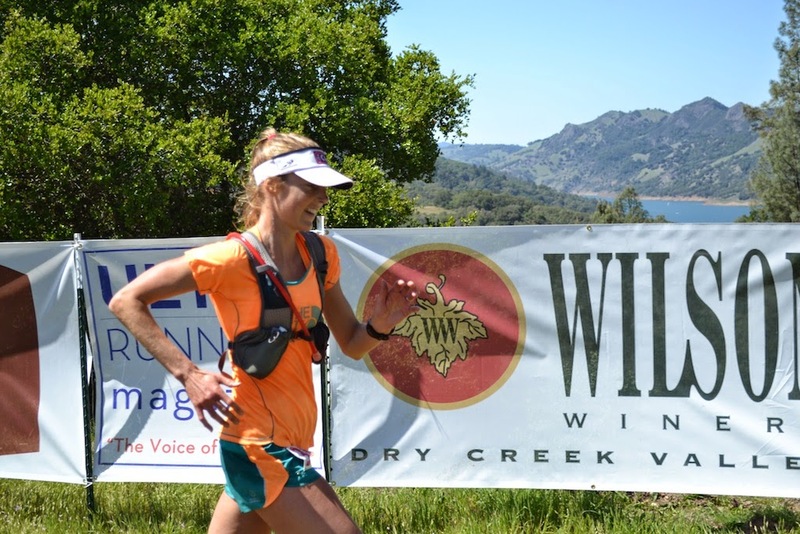 Congratulations on Western States!